The government figure for amount of the UK built on was under 3% last time I checked. It's just not beneficial to the building companies and land owners to release it, so why would they push for it? They can sit on it for 5 years and triple the value. It's also not hard to build houses that are sustainable and don't have a massive foot print if you were to build on the imaginary greenbelt. Which apparently just means land we've already annihilated into farmers fields. New homes isn't the issue, it's the ability to afford a home old or new. If rents weren't double or treble a normal mortgage people might stand more of a chance. The problem is greedy landlords hoovering up properties faster than they can be built and then renting them out for exorbitant and immoral amounts. The fact that this it is actually possible to make significant money by doing this is a loophole that needs closing. Leaseholds for domestic dwellings needs to be chucked as well. Freeholds or nothing as it's too easy to rip people off or take advantage of them. Drumstick wrote: New homes isn't the issue, it's the ability to afford a home old or new. If rents weren't double or treble a normal mortgage people might stand more of a chance. That’s partially true and certainly there are a lot of people that will find it next to impossible to save up a deposit. But as TNAG said earlier, there are also those that can save (or borrow from parents) a deposit but are still priced out because the houses are so expensive that 4 or 5 times their salaries don’t even come close to the price of a house. I have no idea what the solution is, but a period of mass private house building (to up the supply) plus a period of mass council house building (to lower the demand) would help. I don't agree. Building new houses just means in increase in the number of houses out of TNAG's price range. Moggy wrote: But as TNAG said earlier, there are also those that can save (or borrow from parents) a deposit but are still priced out because the houses are so expensive that 4 or 5 times their salaries don’t even come close to the price of a house. Perhaps banks need to change their formula somehow. I appreciate house prices have skyrocketed and salaries haven't, but it isn't 1990 anymore. Drumstick wrote: I don't agree. Building new houses just means in increase in the number of houses out of TNAG's price range. That’s why I said an increase in private homes and council homes. Lots more houses for sale should drop prices, especially if combined with a drop in the demand for rental houses (as council houses would be available). They're are obviously concerns over house prices dropping, which would send people into negative equity possibly. But I think it's more that they want the rich (or well off) to stay that way, and the poor to stay poor. I often wonder why a price freeze wouldn't work better - don't crash the market, but maintain current price houses for a long while until wages catch up. No one loses money on their house, but there is also much less incentive for investors to snap them all up. With wage growth pretty much non-existent, we’d be waiting 250 years for wages to catch up. We've accepted an offer on our house! Got pretty much what we were asking for it as well which is nice. Now just need to get our next move lined up and start dealing with all the conveyancing and general organisation which is required when selling, buying and moving to a new place. Looks like it is going to be absorbing a lot of my free time over the next few months! Yeah sure, although there are parts of the country where house prices are more reasonable where it wouldn't take quite so long, and the hope would be wage growth would improve too. At the very least you'd prevent a continued massive inflation in house prices. How do you freeze house prices? How do you set them in the first place in order to freeze them? You could maybe freeze them at the last price they sold for. You'd get some massively fluctuating prices depending on when houses were last sold, but it would prevent anyone losing money. In reality you'd have to do some much more complex adjustments I imagine. If only. There was a general levelling off around 07-10 but for the most part prices have still been steadily rising for years. Not at quite the ridiculous rate there were in the decade before but it's still a big deal. It depends on the area of the country, but prices have increased massively in Bristol. It means I’ve probably made a huge profit on my flat (if the banana spliting landlords don’t take it) but I’m still priced out of homes in or around this city. Interesting stuff. I'm not sure where the North west is on there though (EDIT: oh yes, it's just right behind the red line). 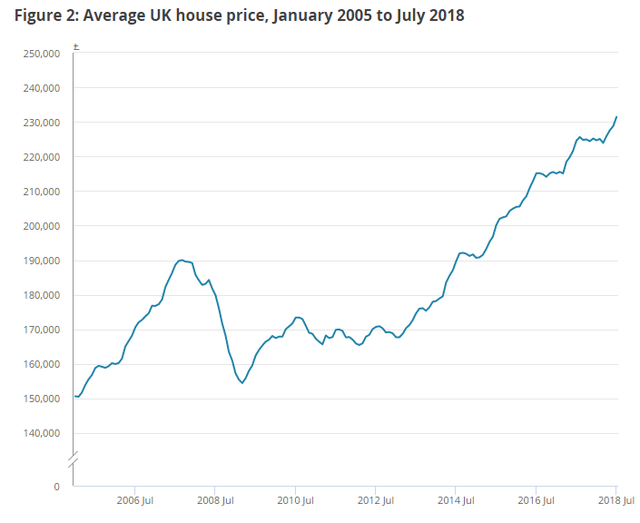 My house went from £30k in 2001 to £120-125k in 2005 and hasn't moved since (I just spoke to a local estate agent just now and they sold a house about 5 doors from me for £121k this week). You'd think that at that house value, you'd see more interest as it's very affordable (4x average wage is about 4x28 = 112k). 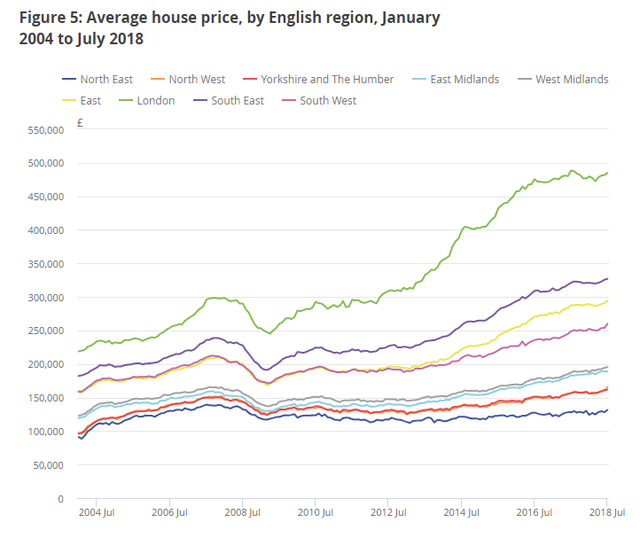 In the north we've seen one or two regions just about increasing since 2007 peak, and one or two with a 20-25% increase in the same time. That's not a great increase in 10-11 years, about 2% per year. Obviously London and other southern areas have seen large growth, 25-50%. I'd be interested to see the national average wage charts for similar time periods.